Summary Two-bay quad-core Intel N3150 "Braswell" Celeron NAS with lots of ports and wide range of downloadable apps. Cons • Not as good price/performance as the AS510XT series. Summary Four-bay quad-core Intel N3150 "Braswell" Celeron NAS with lots of ports and wide range of downloadable apps. ASUSTOR has been pumping out a lot of new NASes of late and we're going to be looking at most of them. First up are the AS6202T (2 drive) and AS6204 (four drive) NASes, the latest additions to ASUSTOR's Power User to Business product line. ASUSTOR seems to take a page from QNAP's playbook, because it's often difficult to tell one ASUSTOR NAS from another. Products share a common case design, number of ports and indicators. The most distinguishing features are the LCD panel and drive tray locks (or lack thereof). Often, the main differences are in processor and the amount of memory. Such is the case with the AS620XT NASes. They look exactly like the AS510XT NASes, which in turn look like the AS500XTs. The AS510XT products both use an Intel J1900 quad-core Celeron processor and ship with 2 GB of RAM. The AS620XT NASes are powered by an Intel Celeron Braswell N3150 quad-core processor with 4 GB of RAM. ASUSTOR claims that the AS620XT NASes are the first to be powered by the "Latest Intel Celeron N3150 processors". The chart below compares the key features of the AS5000T, 5100T, 6100T and 6200T families. There is a new Quick installation guide that is common to all 6000 series NASes. The callouts below are essentially the same shown in the AS500XT review. Note: This image shows the AS6204T, the model ASUSTOR sent for review. It is the only product in the 6000 series that has an LCD screen. The front panel USB port in the lower left corner is a USB3.0 port. There were not front and rear panel callouts available for the two-bay products. But the unannotated rear panel view of the AS6202T below shows connector placement identical to the AS6204T. The two-bay products (AS6202T and AS6102T) both have smaller 70mm fans. Four drive models use a larger 120mm fan. The AS620XTs have ASUSTOR's usual design for easy servicing. Remove the one-piece cover and there is easy access to RAM expansion SODIMM slots on the back of the main board, protected by flaps cut in the board's plastic insulator. To remove the fan, power supply or main board, you'll need to remove a half-dozen or so screws to lift off the rear panel. Once that is done (the fan connects via a single cable), you can get at everything else pretty easily. The main board and drive backplane are joined via a connector, so you don't have to undo the drive backplane to remove the main board. The board design itself is very similar to the AS5104T's, with many of the same components used. Note both SODIMM slots are full, with two 2 GB modules to provide the 4 GB of standard RAM. The modules are held in place with silicone putty, to ensure they stay put during shipping, according to ASUSTOR. There is no mention of this, however, in the RAM installation guide. The key components are summarized in the table below, with those of the AS5104T and AS5004T. We're guessing the AS6202T uses an alternate load of the board above, probably dispensing with some of the ASM SATA components due to its lower slot count. But the designs are similar enough to allow the AS6204T to be tested in a two-drive configuration and accurately represent the AS6202T. With two drives, the NAS drew 19 W with WD Red 3 TB (WD30EFRX) drives spun up and 12 W with them spun down for power save. With four drives loaded, the power draw was 29 W active and 17 W in power-save. We judged noise level low for both two and four-drive configurations. The AS620XT NASes are powered by the recently upgraded ADM 2.5 operating system. It's important to note the new ADM 2.5 uses a different file structure and you can't roll back to a previous version of ADM after upgrading. To find out more, you can check out the new features of ADM 2.5 here. DataSync for Microsoft One Drive (OneDrive for Business not supported by the app). ASUSTOR also has a Live Demo if you want to wrap your hands around the UI and check out some of the new features. If you want to learn more about the ASUSTOR NAS or want to get more out of the ASUSTOR NAS that you already own, be sure to check out the ASUSTOR College. The image below shows the landing page on the live demo site. ADM 2.5.0.R9G1 firmware was loaded onto an AS6204T and performance tests were run using the Revision 5 NAS test process. Since the AS6202T uses the same processor, RAM and Ethernet components, all testing was done on the AS6204T sample provided for review. The AS6204T tests used four drives configured in single RAID 0, 5 and 10 volumes. The AS6202T tests used two drives in single RAID 0 and 1 volumes. All tests were run using Western Digital Red 3 TB (WD30EFRX) generously loaned by WD. The composite image below shows how the AS6202T and AS6204T compare to other products for File Copy Write Performance. The File Copy Write test for both ASUSTOR AS510XT NASes turned in virtually identical scores of ~ 110 MBps, virtually identical to their AS500XT and AS510XT siblings. Note that quite a few NASes in both charts are clustered around 110 MB/s, which seems to be the limit of our test process that uses a single Gigabit Ethernet connected client. We consider performance within 5% as equal for ranking purposes. 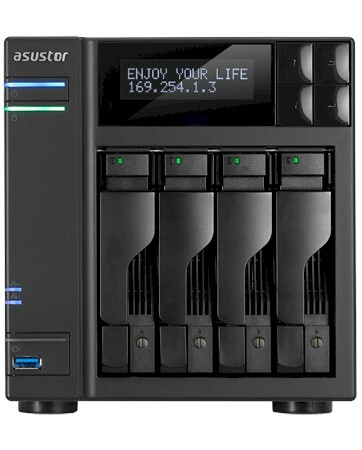 For the two drive comparison, I chose the ASUSTOR AS5102T and QNAP TS-253 Pro. The benchmark summaries below show the AS6202T, AS5102T and the TS-253 Pro. File copy write and read performance was above 100MB/s for both RAID0 and RAID1 for all products. For both RAID levels, the AS6202T had the fastest throughput for the NASPT HD Playback & Record tests. But for a NAS that claims high performance 4K playback as a feature, it trailed both of the other two NASes for NASPT 4x (four simultaneous streams) HD Playback by 10 - 15 MB/s. In addition, the AS5102T outperformed the AS6202T on every backup test for all file types. And the AS6202T turned in the slowest iSCSI Write and iSCSI Read results of all three NASes. The NAS Ranker, filtered for RAID1 and Revision 5 testing shows that the ASUSTOR AS5102T was able to hold on to its #1 ranking followed by the ASUSTOR AS5002T ranked at #2. The AS6204T earned a #5 ranking. 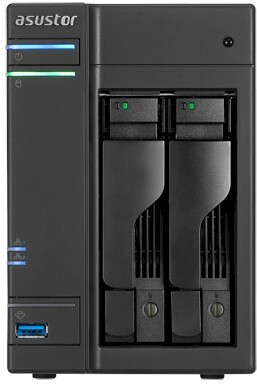 If you sort the RAID1 NASes by price, you'll see that it is the most expensive two-bay NAS. Since there was a tie for #4, that are five NASes that represent a better value than the AS6204T. The chart below shows the individual and category scores for the same three NASes used in the two-bay benchmark summaries above - the ASUSTOR 6202T, the #1 ranked AS5102T and #4 ranked QNAP TS-253 Pro. The total NAS score for the AS6202T was pulled down by relatively low category scores for Write Benchmarks, Video and iSCSI benchmarks. For four-bay NASes, I used the corresponding four-bay versions of the NASes shown above. The chart below shows the AS6204T, AS5104T and TS-453 Pro. File copy Write and Read results were consistent across all RAID levels (RAID 0, 5, & 10) for all NASes with the exception of the relatively low performance of RAID 5 and RAID 10 File Copy Read performance on the AS6204T. For USB 3.0 backup the FAT and EXT3 results compared to the other two NASes were disappointing. The relatively poor iSCSI Write and Read performance noted on the AS6202T - especially iSCSI Write - was not seen on the AS6204T. Once again, both ASUSTOR 5000 series siblings, the #6 ranked AS5104T and the #8 ranked AS5004T, as well as the #7 ranked QNAP TS-453Pro had better Total NAS rankings at a lower price than the AS6204T. Looking at the subcategories, the results were pretty much as expected. The AS5104T outperformed the AS6204T in every category except for Backup and iSCSI. Clearly, the issues that earned the AS6202T a #7 category ranking in the two drive version were not observed with the AS6204T which grabbed a #1 rank for iSCSI category. The major differences between the AS620XT and the AS510XT families are processor, amount of RAM and firmware version. Just looking at the hardware specs, you would think the newer Intel Celeron N3150 quad-core processor used in the AS620XT with 4 GB of DDR3 RAM would outperform the Intel J1900 quad-core processor with 2 GB of DDR3 RAM used in the AS510XT products. But our testing did not show this. For two-bay NASes, the ASUSTOR AS5102T and the AS5002T held on to their #1 and #2 rankings, respectively, and there were a total of five two-bay NASes with lower prices but better Total NAS rankings. For four-bay NASes, while there are a lot more products in our NAS Charts, the story is pretty much the same. The NAS Ranker showed the ASUSTOR AS5004T and AS5104T (and QNAP's TS453 Pro) had better Total NAS rankings than the AS6204T and were cheaper, too. Looking at the chart below and based on price and performance for the tests we perform, the ASUSTOR AS510XT products still offer the better bang for the buck than the AS620XTs.